The M100-DS series of summation transducer take up to four inputs and provide an output signal directly proportional to the sum of the inputs. A typical application is the summation of total kW of four separate generating sets e.g. 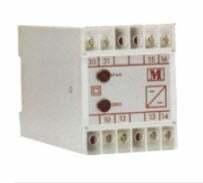 the four individual kW readings are provided by M100-WA4 transducers with 0-1mA output signals.